Cinnamon Plum Jam – Best ever! Cinnamon Plum Jelly – Best Ever! Boil plums in white wine with 4 of the cinnamon sticks until the fruit is fork tender. Puree in a blender, remove the cinnamon sticks if you can before. Strain the mixture thru a small wire sceive. The color should be beautiful. Pour blended plums back into you heavy pot, add pectin and bring to rolling boil for 1 minute. Add sugar, bring back to rolling boil for 1 full minute. Pretty isn’t it! Add a fresh whole cinnamon stick to the jar and pour in the jelly to ½ inch from the top. Process in a water bath for 5 minutes. Makes 3 pint jars, or 6 cups of jelly. I have made 4 batches in the last month. It flies off the shelf. About 35 calories per Tablespoon. 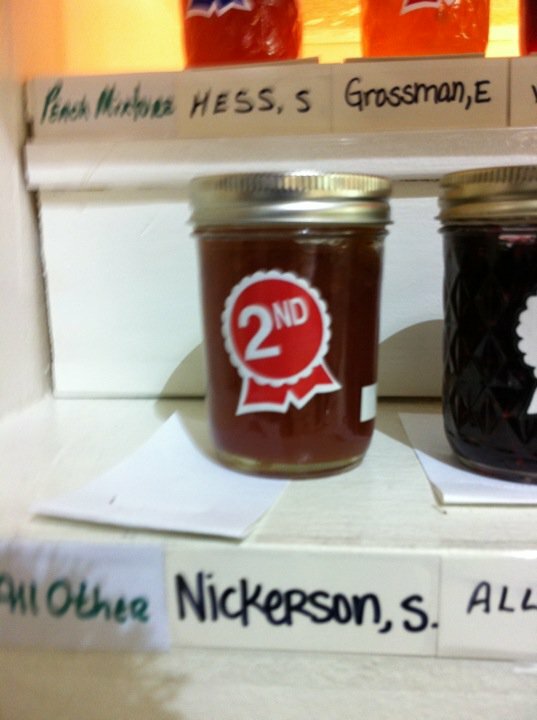 This entry was posted in Jams and Jelly and tagged Plum Jam Jelly. Bookmark the permalink.